A classically styled four claw solitaire diamond pendant with princess cut diamond. A Tiffany inspired Princess cut Diamond solitaire pendant. This both classic and timeless pendant holds a lustrous solitaire Diamond within a four claw pendant setting. The carat weight and clarity of the striking Princess cut Diamond can be selected to suit your personal preference. An opulent expression of beauty and the perfect addition to any jewellery suite, the accessory that can add sparkle and compliment any outfit or occasion. The pendant comes supplied with an 18inch chain and the hanging bail allows the pendant to rest gracefully, to make the perfect centrepiece. This design is available in 18 Carat White or Yellow Gold and 950 Platinum. Please allow 4 weeks for delivery as this meticulously finished pendant is crafted to order. It will then arrive with you beautifully packaged, ready for the perfect moment. We deliver all parcels to USA by FEDEX. Upon completion your parcel is collected from our showroom. 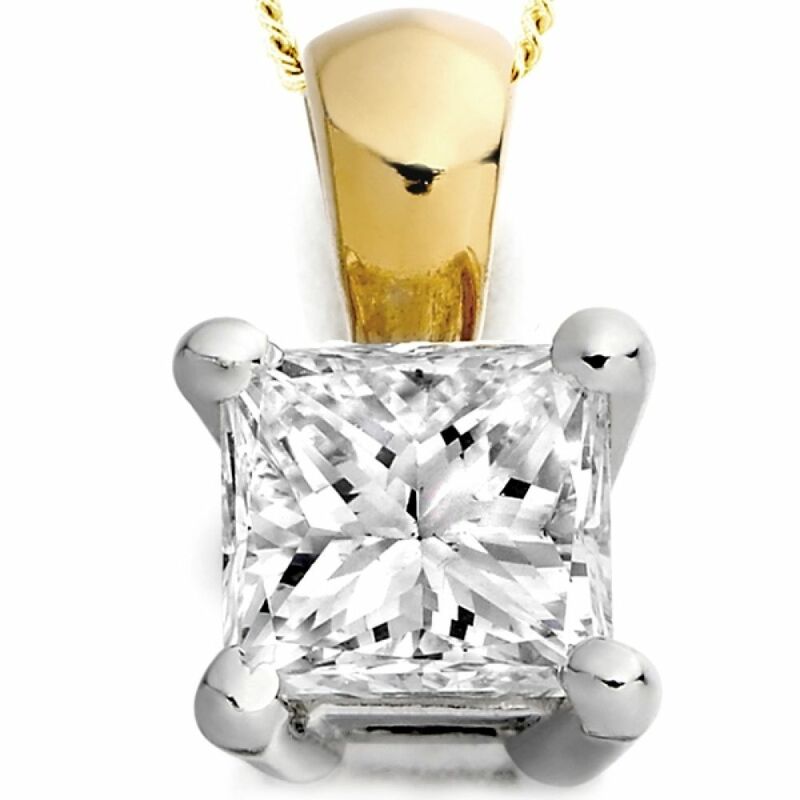 With payment in your local currency, we include all duty and tax to ensure the smooth journey of your diamond pendant. Taking around 1-2 days your parcel will require a signature upon arrival. Inside the plain outer wrapping, you will find our large lidded main outer box. Within this box you will find your pendant inside the large pendant presentation box, delightfully presented and accompanied by your documents. All diamonds sourced at Serendipity Diamonds are hand selected by our expert team. Working with 100% natural diamonds, purchases arrive with conflict free assurances and the reassurance that their diamond was formed billions of years ago below the ground. To provide the very best sparkle and brilliance we only choose diamonds reaching a very good cut grade to ensure the best proportions. If you require an excellent cut grade, please contact us for a personal quote. Most of our diamonds are fully certified by the very best diamond grading laboratories including the Gemological Institute of America (GIA). All diamond solitaire pendants weighing 0.30 carats and above, selected in grades above J colour and SI2 clarity will include full certification for your reassurance. 18" chain included as standard, but other lengths available upon request. Service rating : I bought a necklace for my mother's 60th birthday and had been having troubles finding the right thing. So when I found the perfect one at serendipity diamonds I was pushed for time but their great service meant my mum got her present on time.